How might we promote learning centered around connectedness and discovery at the Natural History Museum? Aspen—a new way of exploring the museum based on your interests. Through a combined digital and tangible system, Aspen aims to nudge you towards relevant museum artifacts and encourage you to explore connections between artifacts with each other and yourself. We visited the museum to understand the problem space a bit better. We initially had these 3 questions in mind to help us define the scope of our project. What role may individual stories play in engaging users with individual exhibits (e.g. the anthropocene exhibit)? We also created a map to see all the stakeholders involved at the museum and how they are connected. There are three main categories: Museum Visitors (both one time and repeated), Museum Employees (both front stage and backstage), and Museum Non-Visitors. Personal the experience based on individual stories. We first tried to understand the current situation better by interviewing 12 Carnegie Museum visitors. We informally asked their opinion on the purpose of museum, their overall museum experience, personal connection to museum content and nature, areas they liked least and most in their previous museum visits, and personal pain points they experienced in their museum visit. We also sent out a survey to potential museum visitors and received 24 survey responses. We asked their opinion on the purpose of museum, their overall museum experience, personal connection to museum content and nature, areas they liked least and most in their previous museum visits, and personal pain points they experienced in their museum visit. We also asked they what they think the purpose of a museum is. Survey results pointed towards urban dwellers craving some sort of genuine exposure to nature while certain niche users acting as museum aficionados. We liked how the Cooper Hewitt pen encourages the visitor to engage with the museum artifacts in a more playful way and how the Explorer App considers your interests and offers beacon oriented interest spots in the museum. The highly interactive nature of the exhibits of the Exploratorium and Google Web Lab appealed based on making technology more relatable and useful for people. We synthesized all the research for patterns and pain points. We then used the key insights to derive main design principles that helped guide us during our concept development. With those insights in mind, we rapidly developed two concepts with a goal to personalize the museum experience while facilitating unexpected discovery via wayfinding. To better understand feasibility and desirability of each concepts, we did few user testings with our classmates and friends to validate each concept. It's better to fail fast, and iterated fast earlier on! A simulated AR way-finding using transparencies and your phone camera. Our final combined concept is to personalize the museum experience by considering the interests of the visitor and then facilitating unexpected discovery by suggesting to them artifacts that they might like, but would have otherwise missed. The visitor is also able to tap the plaque to save the artifact and then display and engage with it later a multi-touch table and then on a website when they are home. They also receive a take-away postcard as a physical souvenir of their museum exhibit. This takeaway doubles as a DIY dymaxion cube and instructions for visiting the website. Our project is called Aspen. Our concept involved five main parts: a vibrating hand held object in the shape of a dymaxion cube, a tap-able placard, a multi-touch table, a website, and a paper takeaway postcard. We validated out concept with three employees of the museum: Jonathan Gaugler, Media Relations Manager; Mandi Lynn, Program Development Coordinator; and Laurie Giarratani, Director of Education. They validated our idea and gave up some more helpful information that was in line with our principles. Jonathan mentions that the museum struggles with how much content to show for each artifact. Mandi said that in the past, the museum has suggested a route to walk through the museum and that was successful. Both Mandi and Laurie wished the the Museum could have more data about the visitors (e.g. which artifacts they like, what questions they might have, etc.). Capturing this data and being flexible with the content can help the museum design future exhibits. 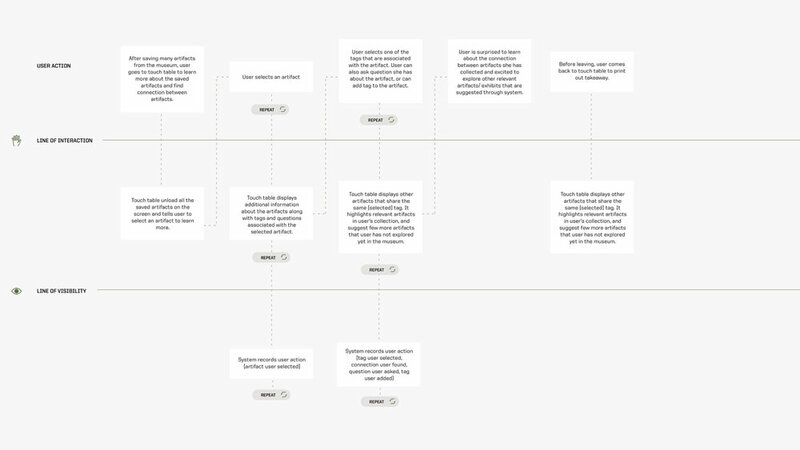 We developed a visual design system for our project to keep everything scalable and cohesive. 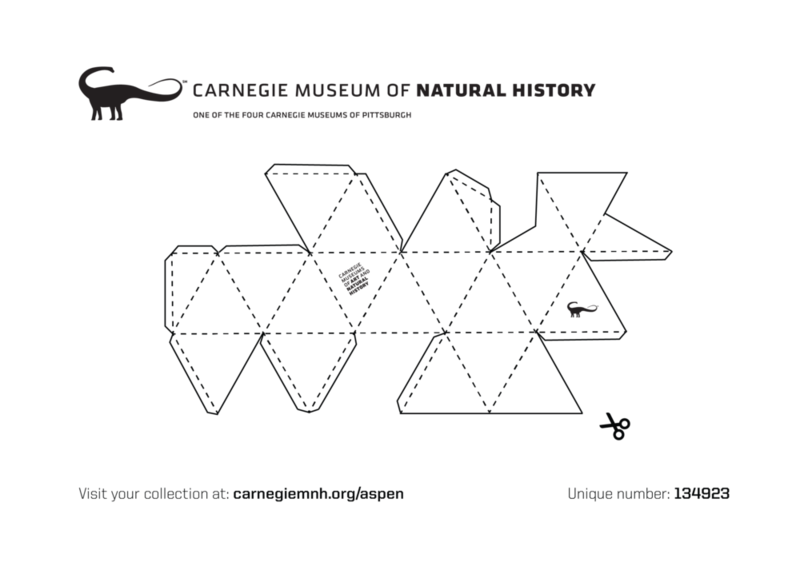 We derived inspiration from other museums, the current branding of the Carnegie Natural History Museum, and nature. Our project is called Aspen because an aspen is a type of tree, which is fitting for the nature theme. Also, the aspen tree has a connected root system that talks to each other. This is a great metaphor of our project which touches upon the connection between different artifacts in the museum and the connection of these artifacts to us. Our logo is minimalistic to not get in the way of the artifacts at the museum. We wanted it to be seamless with the existing ecosystem. Central to our project is the Dymaxion Map, which has a link to our theme of connectedness (read Buckminster Fuller). The dymaxion fold nicely up to a 3D form (as seen in our vibrating object) and opens up to lay flat as a 2D form (as seen in our takeaway). The triangular faces of the Dymaxion Map serves as the visual representation of museum artifacts for our user interfaces. We considered the design system of the Museum of Natural History. The CMOA brand, for the most part, uses Klavika as its logo and title font, and PT Serif and Franklin Gothic Book for body content. We used a typeface called ‘United’ that is similar to Klavika, but has more angled corners to make sure it goes well with the visual system we decided upon, which include triangles. Through the use of color, we wanted to express ‘sense of nature’ through earthy tone color scheme. We choose a color palette that would work on a black background (e.g. our touch table interface) and white background (e.g. our website). This project involved many components. We handed of the specs to the museum to implement. To take it a step further we could build out a mobile version of the website. We also saw the data being collected by this project as useful for planning future exhibits.